Gawker just published some emails where Apple CEO Steve Jobs comes off as pretty rude to journalism student Chelsea Issacs. We here at TechCrunch we have a tradition of Peter Kafka-esque skepticism when it comes to emails from journalism students, but especially ones that seem to be at the center of some shady Internet fame seeking business themselves. The whole thing comes off as incredibly fishy, especially right after the “Steve Jobs Ninja Stars” incident and especially on this especially slow news day. So after asking Chelsea Issacs whether this was some kind of grand blogger setup and receiving no response, I sent Steve Jobs an email of my own. And am waiting to hear back, from him or anyone at Apple really. Here is the alleged Jobs/Issacs exchange as emailed to us below. Parts that seem notable in bold. Please take a look at the email correspondence I just had with Steve Jobs. I am a student in a journalism course and after asking him a question, he responded rather rudely. See for yourself. Thanks. Subject: Re: Mr. Jobs – Student Journalist Concerned about Apple’sMediaRelations Dept. 1. I AM one of your 300 million users. 2. I DO have a problem; I need answers that only Apple Media Relations can answer. Now, can they kindly respond to my request (my polite and friendly voice can be heard in the first 5 or 10 messages in their inbox). Please, I am on deadline. Nope. We have over 300 million users and we can’t respond to their requests unless they involve a problem of some kind. Sorry. Thank you for your reply. I never said that your goal should be to “help me get a good grade.” Rather, I politely asked why your media relations team does not respond to emails, which consequently, decreases my chances of getting a good grade. But, forget about my individual situation; what about common courtesy, in general — if you get a message from a client or customer, as an employee, isn’t it your job to return the call? That’s what I always thought. But I guess that’s not one of your goals. Yes, you do have a creative approach, indeed. Our goals do not include helping you get a good grade. Sorry. As a college student, I can honestly say that Apple has treated me very well; my iPod is basically the lifeline that gets me through the day, and thanks to Apple’s Final Cut Pro, I aced last semester’s video editing project. I was planning to buy a new Apple computer to add to my list of Apple favorites. Because I have had such good experiences as a college student using Apple products, I was incredibly surprised to find Apple’s Media Relations Department to be absolutely unresponsive to my questions, which (as I had repeatedly told them in voicemail after voicemail) are vital to my academic grade as a student journalist. For my journalism course, I am writing an article about the implementation of an iPad program at my school, the CW Post Campus of Long Island University. The completion of this article is crucial to my grade in the class, and it may potentially get published in our university’s newspaper. I had 3 quick questions regarding iPads, and wanted to obtain answers from the most credible source: Apple’s Media Relations Department. I have called countless times throughout the week, leaving short, but detailed, messages which included my contact information and the date of my deadline. Today, I left my 6th message, which stressed the increasingly more urgent nature of the situation. It is now the end of the business day, and I have not received a call back. My deadline is tomorrow. Mr. Jobs, I humbly ask why Apple is so wonderfully attentive to the needs of students, whether it be with the latest, greatest invention or the company’s helpful customer service line, and yet, ironically, the Media Relations Department fails to answer any of my questions which are, as I have repeatedly told them, essential to my academic performance. For colleges nationwide, Apple is at the forefront of improving the way we function in the academic environment, increasing the efficiency of conducting academic research, as well as sharing and communicating with our college communities. With such an emphasis on advancing our education system, why, then, has Apple’s Media Relations team ignored my needs as a student journalist who is just trying to get a good grade? In addition to the hypocrisy of ignoring student needs when they represent a company that does so much for our schools, the Media Relations reps are apparently, also failing to responsibly handle the inquiries of professional journalists on deadlines. Unfortunately, for a journalist in the professional world, lacking the answers they need on deadline day won’t just cost them a grade; it could cost them their job. 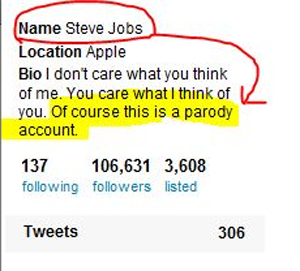 And besides, if this is real, Jobs is totally in the right. My question: Is your Steve Jobs email part of a project to see if you can trick the media? I’m pretty good at telling the truth, so be honest with me.